THE STAR arrives for the first time on Digital on February 6, 2018 and on Blu-ray + DVD + Digital February 20 from Sony Pictures Home Entertainment. A few years ago I decided to lead a devotional for our teen mom support group around the Christmas story. I wanted to share about the wisemen who followed the star. My desire was to let these young moms know that sometimes we have to leave what is know and comfortable to follow Jesus … such as the wisemen did. What I didn’t expect was that most of the young moms were unfamiliar with the Christmas story. Moving beyond the Christian bubble, I’ve been surprised by how many people do NOT know the Christmas story. These young moms looked at me like I was crazy when I told them about the virgin Mary, the angels’ visit, and the holy couple’s the journey to Bethlehem. It sounded like a fairy tale to them as I described Christ’s birth and the angels’ announcement. I assured her that it WAS what Christmas was about, and then we went back and read the first chapters of Luke, in the New Testament. 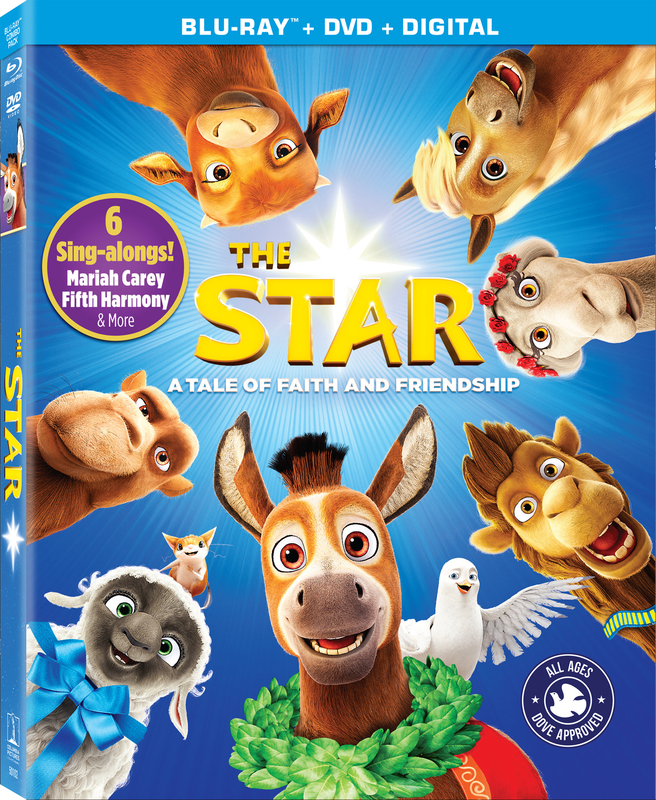 What started as a simple devotion about wisemen following the star turned into a lesson about the Son of God come-to-earth, and what may seem like a sweet, animated film about a little donkey named Bo introduces families to the true meaning of Christmas. If it takes an animated movie to help secular society first hear about the coming Savior, then I’m all for that. I truly believe that any way we can proclaim Christ’s name and mission on earth it is worthy of our time and attention. All that said, this movie is well-done, and much appreciated. The voice acting is stellar, and the humor and action will keep children engaged. The sound-track is one we’ll be listening to all through the Christmas season. Kudos goes all those who’ve poured so much into making this movie shine! In The Star, a small but brave donkey named Bo yearns for a life beyond his daily grind at the village mill. One day Bo finds the courage to break free and ends up befriending newlyweds Joseph and Mary. Mary’s kindness soon sets Bo on the adventure of his dreams. On his journey, he teams up with Ruth, a loveable sheep who has lost her flock, and Dave, a dove with lofty aspirations. Along with three wisecracking camels and some eccentric stable animals, Bo and his new friends follow the Star and become unlikely heroes in the greatest story ever told – the first Christmas. I was able to watch this movie with my six younger kids and two grandkids, and the kids absolutely loved this movie! The story is told from the point-of-view of the animals, but—friends—it truly is the Biblical story. It has the angel’s visit to Mary, it shows her humble and obedient response. It reveals the relationship between this biblical couple, bringing their story to life in a way that children will understand. It highlights their journey, and some of the challenges of the time. There are also the wise men, off to discover a prophesied king, and it reveals the dark heart of King Herod, who fears having his throne taken from him. Of course there are artistic liberties taken—it’s told from the point-of-view of animals, friends! This is not The Nativity Story put to animation. But, still, I found the story beautifully done. There was enough humor and drama to keep my kids hooked, and there were meaningful moments that truly brought the Bible to life—even for the little ones. The voice cast is led by Steven Yeun (Bo the donkey), Gina Rodriguez (Mary), Zachary Levi (Joseph), Kelly Clarkson (Leah the horse), Patricia Heaton (Edith the cow), Kristin Chenoweth (Abby the Mouse), Christopher Plummer (King Herod), and Tracy Morgan (Felix) and Tyler Perry (Cyrus) and Oprah Winfrey (Deborah) as the three camels … to name a few. Let me think … let’s gather some of the biggest names in Hollywood to come together and create a film that will share the story of Christ-coming-to-earth … yes, please! I was honored to be able to travel to LA and interview the director and some of the actors. My podcast with those interviews will be up soon. I can’t wait for you to hear the true heart and passion from the creators of this film. The Star is directed by Academy Award®-nominated writer/director Timothy Reckart; executive-produced by DeVon Franklin. I was able to meet Timothy in Beverly Hills, and I was able to talk to DeVon Franklin by phone. Also, in Beverly Hills I interviewed Patricia Heaton, Gina Rodriguez and Zachary Levi … how exciting is that? Through our interviews what really came through was their excitement about sharing the story of Christ to an audience that may be unfamiliar with biblical truths. “We looked at it as the greatest story never told,” kids executive producer DeVon Franklin. Having previously produced the faith-based hit Miracles from Heaven and overseen the blockbuster Heaven Is for Real as an executive at Columbia Pictures, Franklin was inspired to translate the meaning of the story beyond the literal telling into a journey about the choices we all make in our daily lives that have an impact and, eventually, fit into the framework of the human story at the heart of it all. “It says a lot about teamwork, stepping outside of their own somewhat narrow perspectives and working together. Our hero, Bo the donkey, needs all of the other animals to help to become successful. It’s also about hope—you’ve got to believe in the impossible for it to happen. Take Away: This movie will be loved by family-friendly audiences, and it can be shared with neighbors and friends–especially those beyond our Christian bubble. It’s a fun introduction to the Christmas story and the true meaning of Christmas. It’s one our family can’t wait to purchase, and I can see this movie becoming part of our favorite family traditions. 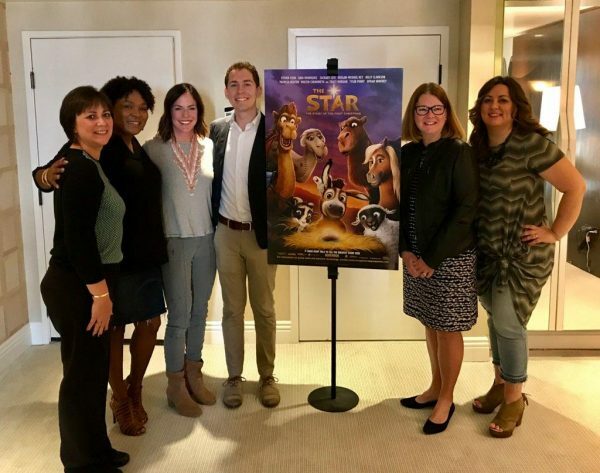 I was invited to an all-expense paid trip to Los Angeles courtesy of Sony to attend the #TheStarMovie Press Junket and screening in exchange for my coverage. No other compensation was provided. All views shared are completely my own.